Every year at Christmas, adults and children have their own expectations, primarily related to miracles, gifts, Santa Claus, especially cold weather, the completion of Christmas Lent and various other important things. 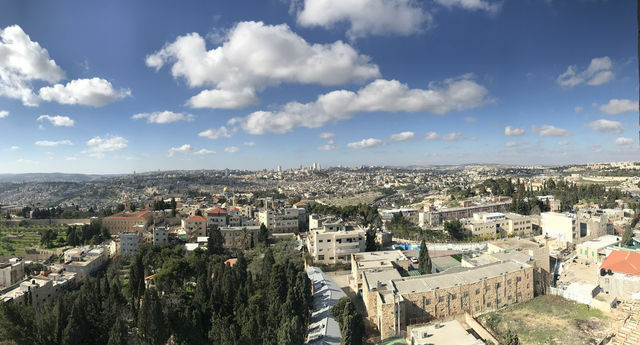 In Jerusalem, in 2019, on Christmas Eve from January 6 to 7, the weather was rainy and rather cold - + 3-4 degrees Celsius, which filled the pre-Christmas expectations even more emotionally. On a quiet cold night in Bethlehem of Judea, the baby-born Jesus Christ was born in a manger for young animals, to whom there was no place among people. 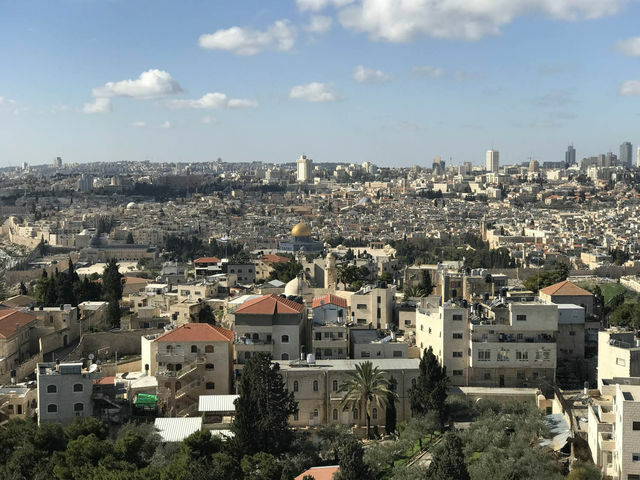 This mystery of the appearance of the Messiah in Bethlehem has already opened for more than 2,000 thousand years and in the tradition of many millions of Orthodox believers around the world has become one of the most important and especially revered great twelve great holidays. As a rule, everyone is waiting for special miracles at Christmas, and the mystery of this holiday is revealed precisely in the fact that these miracles do occur, often in an imperceptible and invisible way - in some good deeds, good advice, well-established circumstances on this night and the following day. due to which difficult circumstances are resolved. So, on this Christmas night, the bad weather became comfortable, and the Christmas day was clear and bright. With the blessing of Archimandrite Roman (Krasovsky), Head of the Russian Ecclesiastical Mission of the Russian Orthodox Church Outside of Russia (ROCOR) and Mother Superior of the Eleon Monastery Abbess, Varvara, a cleric of the Russian Ecclesiastical Mission of the ROCOR, Priest Roman Gultyaev, performed a festive Christmas Liturgy of the Russian Orthodox Mission, Hierarch Roman Gultyaev, celebrating the festive Christmas liturgy of the Russian Orthodox Mission, Roman Gultyaev, celebrating Christmas with the Russian Orthodox Church Ecclesiastical Mission; ponomarie singing carols. The chorus of singers consisted of children whose parents and relatives prayed right there at the liturgy. The adults sang "I Believe" and "Our Father," some of the children helped to hold special candles, and to give the censer a censer. Then the children's choir performed wonderful Christmas carols. Both adults and children together became partners in Christmas worship. For them it was a real Christmas miracle! 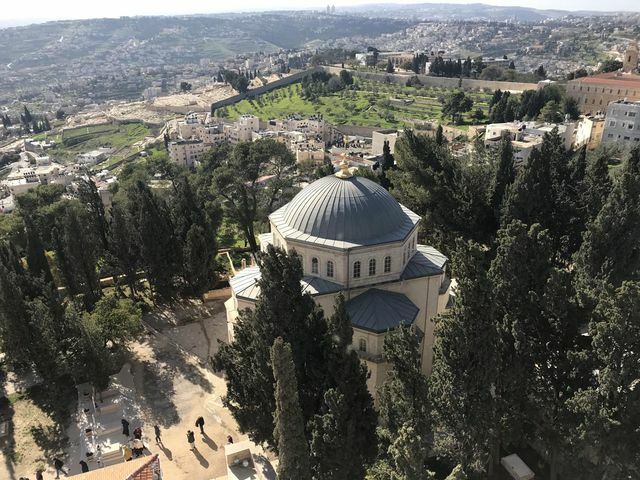 The service was held in a cozy home church in the name of the holy righteous Philaret the Most Gracious, which is located in the refectory of the Ascension Monastery on the top of Mount Eleon in Jerusalem. 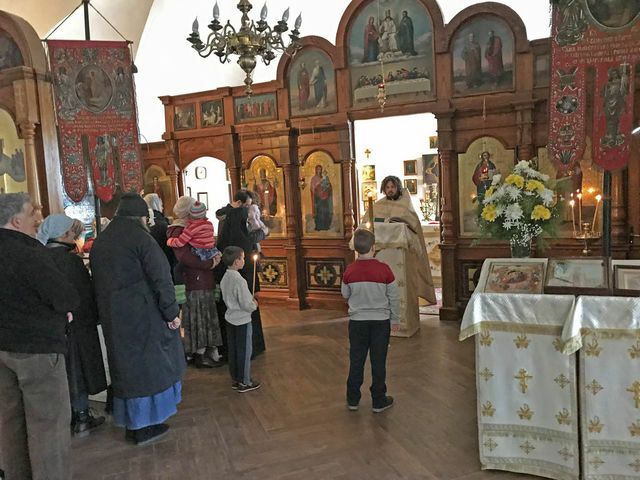 This church was founded on the initiative of the student of the famous Archimandrite Antonin (Kapustin) Hegumen Parfeni (Narcissov) on December 1 (old style) 1907. 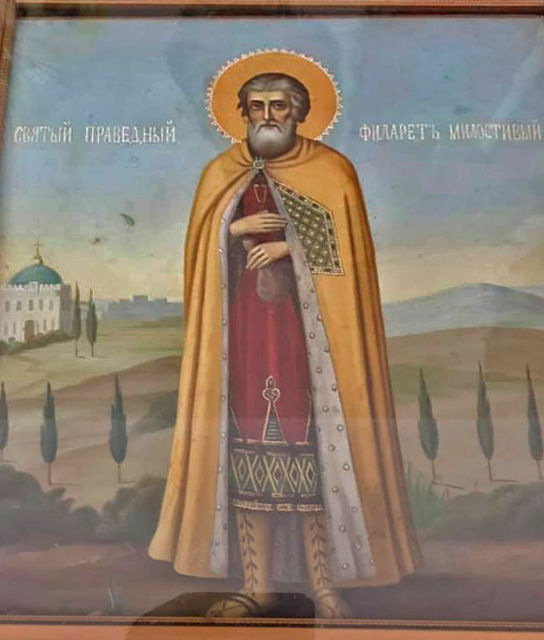 The project was conceived as a two-tier cathedral, in which the upper cathedral was to be dedicated to the Last Judgment, and the lower church in the refectory monastery in honor of the holy righteous Philaret the Merciful. The second floor of the cathedral remained only in the project, and the lower part of the refectory church was erected by the forces of the monastery from 1907 to 1914. 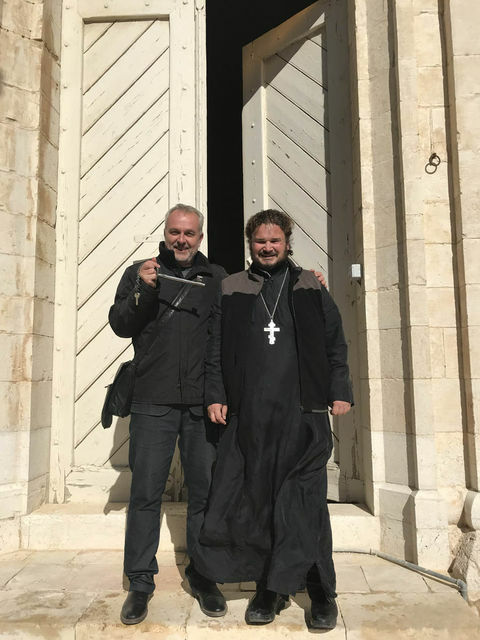 According to the idea of ​​Abbot Parfeni, in the refectory temple should be shown mercy and take all the hungry and needy. At the end of the service, Father Roman addressed the audience with a word in which he thanked Archimandrite Roman (Krasovsky) and Father Superior Varvara for the unique opportunity to serve Christmas service with the participation of children in such a beautiful place, and noted that on the day when the Blessed Mother of God Jesus Christ was born , in Jerusalem, turned out to be a real family Christmas holiday for adults and children, where everyone became involved in the holiday of the Nativity of Christ. After the service, festive food and gifts were prepared for adults and children. Adults liked Christmas carols so much that they asked the children to perform a few more selected pieces. 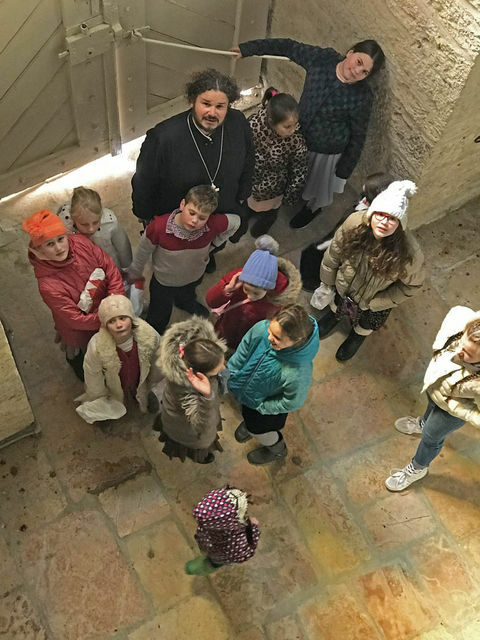 Priest Roman Gultyaev with Orthodox children from Jerusalem at the entrance to the bell tower "Russian candle"
Congratulations to all on the feast of the Nativity of Christ!